Bethel Saler. 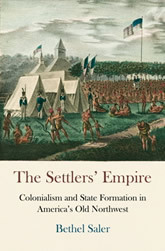 The Settlers’ Empire: Colonialism and State Formation in America’s Old Northwest. University of Pennsylvania Press, 2014. The 1783 Treaty of Paris, which officially recognized the United States as a sovereign republic, also doubled the territorial girth of the original thirteen colonies. The fledgling nation now stretched from the coast of Maine to the Mississippi River and up to the Great Lakes. With this dramatic expansion, argues author Bethel Saler, the United States simultaneously became a postcolonial republic and gained a domestic empire. The competing demands of governing an empire and a republic inevitably collided in the early American West. The Settlers’ Empire traces the first federal endeavor to build states wholesale out of the Northwest Territory, a process that relied on overlapping colonial rule over Euro-American settlers and the multiple Indian nations in the territory. These entwined administrations involved both formal institution building and the articulation of dominant cultural customs that, in turn, served also to establish boundaries of citizenship and racial difference. In the Northwest Territory, diverse populations of newcomers and Natives struggled over the region’s geographical and cultural definition in areas such as religion, marriage, family, gender roles, and economy. The success or failure of state formation in the territory thus ultimately depended on what took place not only in the halls of government but also on the ground and in the everyday lives of the region’s Indians, Francophone creoles, Euro- and African Americans, and European immigrants. In this way, The Settlers’ Empire speaks to historians of women, gender, and culture, as well as to those interested in the early national state, the early West, settler colonialism, and Native history.